(ROTIM) - RISE of the Independent Magazines is a premier media company founded by fashion influencers Sofia Davis and Billie Blunt. October 30, 2017 - Fashion Avenue News Magazine and BB Magazine are pleased to announce a partnership to produce an association of publications with a bonafide goal to enhance quality in every editorial content. A commitment to excellence will always happen before broadcasting what is next to happen in the amazing and evolving fashion world. BB Magazine and Fashion Avenue News Magazine will continue to operate under separate entities, but their joint venture RISE of the Independent Magazines (ROTIM) will enable professionals to increase business revenue through their luxurious fashion events, exclusive RISEcard benefits, media sponsored events, and the highly anticipated RISE of the Independent Magazine’s Fashion Show. Our utmost priorities are quality, creativity, and growth. Each quarter we will review the membership applications from other magazine editors who are looking to join the ROTIM team. Associating your publication with RISE of the Independent Magazines (ROTIM) will expose your magazine’s editorial content to our 20,000 print magazine readers, 510,000 email lists, and 33,000 social network followers. We are interested in working with magazine editors who have a genuine interest to see their business RISE to the next level. Fashion consumers are undoubtedly supportive of the independent fashion market. Therefore it is imperative that magazine owners deliver top-tier editorial content, allowing each consumer to have a clear perception of the new fashion collections, accessories and styles soon to fill the shelves and even reach their closets. Strengthening our relationships with models will always be paramount to the ROTIM media company. Models are essential to everyone’s bottom-line - Selling garments! RISE of the Independent Magazines would like to serve models with astonishing fashion pages to use as tear-sheets which is a great interest to reputable model agencies. While nurturing relationships with seasoned models is important, it is equally important to establish professional relationships with aspiring models who take modeling seriously. RISE of the Independent Magazines may interact with aspiring models via castings, workshops, open houses and luxurious fashion events. Independent magazines working together will enable more models to get published and RISE above the norm in this competitive industry. Professional photographers are encouraged to get their names added to The List. Photographers who appear on The List may receive special invites to industry events. There are several exciting fashion events already scheduled for November 17, 2017 at Le Reve, and February 14, 2018, an event in association with NYC Live Fashion Week - A Fashion Show and a Live Mannequin Showroom, which ROTIM is the media sponsor. Photographers who appear on The List may also enter private meetings with magazine editors to present new editorial concepts for magazine covers, back covers, and/or full spreads. 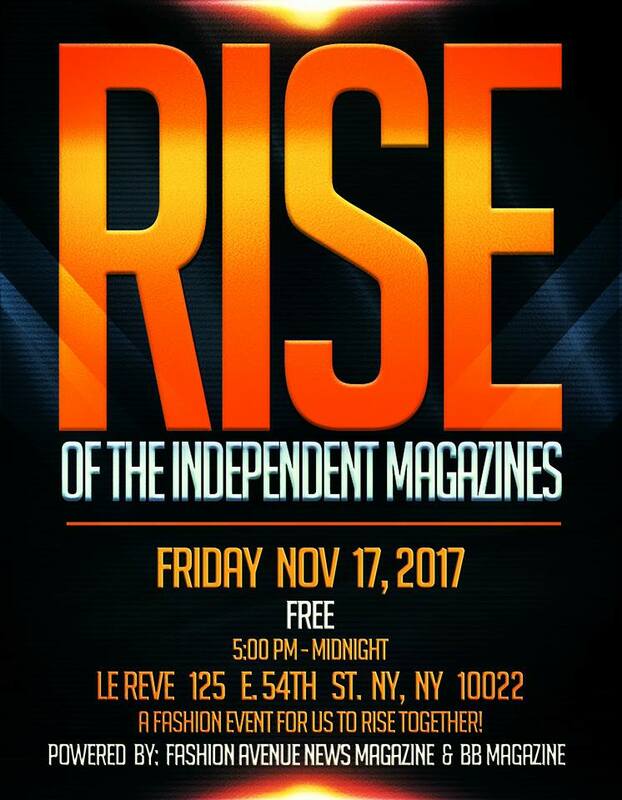 Please join the RISE family on November 17, 2017. It’s a fashion industry celebration and a time to honor some very talented people who continue to RISE in their careers! Sofia Davis & Billie Blunt will also speak about the#RISEcard.